Jenkins (history and religious studies, Pennsylvania State Univ.) believes that we are on the verge of a transformational religious shift. As he explains it, Christianity, the religion of the West, is rapidly expanding south into Africa, Asia, and Latin America, and he predicts that by the year 2050, only about one-fifth of the world's three billion Christians will be non-Hispanic Caucasian. By numbers alone, they will be able to overwhelm the present political secular nation- and city-states and replace them with theocracies, similar to the Islamic Arab nations. He ends with a warning: with the rise of Islam and Christianity in the heavily populated areas of the Southern Hemisphere, we could see a wave of religious struggles, a new age of Christian crusades and Muslim jihads. These dire prognostications could be seen as just another rant from a xenophobic pseudo-prophet; however, the author is a noted historian, and his statements are well formed, well supported by empirical evidence, and compellingly argued. The only criticism is the brevity of the book. 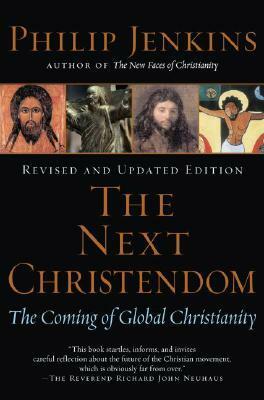 One hopes that The Next Christendom is only an introduction to a deeper analysis of a fascinating topic. Recommended for all libraries. Glenn Masuchika, Rockwell Collins Information Ctr., Cedar Rapids, IA Copyright 2002 Reed Business Information, Inc. --This text refers to an out of print or unavailable edition of this title.